Electric truck with drivers and ZEV managing director. 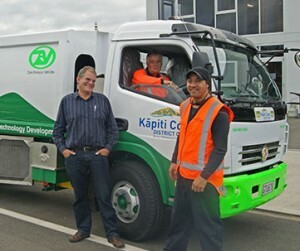 The Kāpiti Coast District Council purchased a battery-electric refuse truck developed and built by local clean tech company Zero Emission Vehicles Ltd, and the first of its kind in the Southern hemisphere. The ‘Enviro 9000’ truck which went into service in 2013 is used to empty public litter bins around the Northern Part of the district each day, including Ōtaki. The Council’s Ōtaki depot has a recharging point for the vehicle. The vehicle has reduced operating costs (two thirds less) and carbon footprint (12 tonnes CO2 saving per year) compared to a diesel equivalent, and produces no tailpipe emissions. It can drive up to 150km on a single overnight charge. It is traveling the streets of Ōtaki putting out zero harmful emissions and using zero diesel. Gone, too is the noise of a diesel engine: the truck produces far less noise than the traditional diesel motor.Zero Emission Vehicles tested a prototype of the truck at Clean Technology Centre in Ōtaki, and the completed vehicle was also tested there by independent experts.